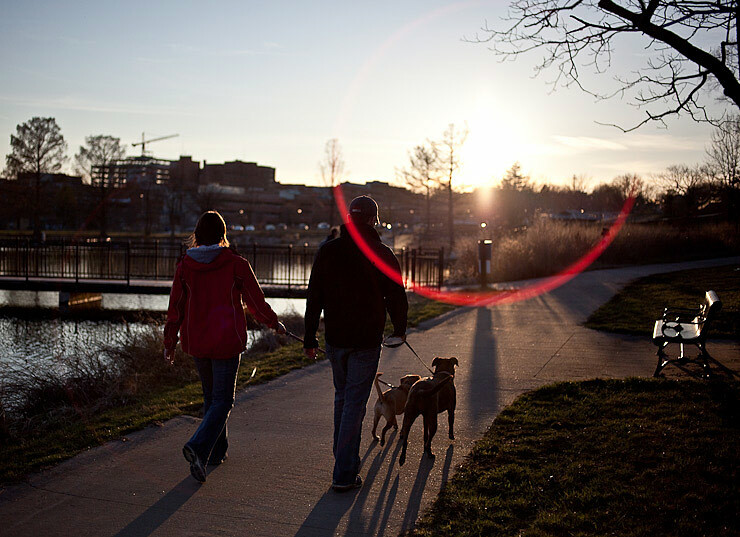 Walking the dogs into the sunset, Stephens Lake Park, Columbia, Mo. | Canon 5D Mk. II and Voigtlander 40mm f/2 Ultron lens; exposed 1/8000 sec. @ f/2, ISO 200. On Thursday afternoon I headed back to Stephens Lake Park to continue “note taking” for an essay on the park that is right off of Broadway, yet feels almost like you’re immersed in nature in the middle of Columbia, Missouri. I saw almost because the illusion fades when your boot gets stuck on the landscape fabric that’s underneath all of the pebbles on the side of the waterfalls…yeah, those were man-made.